This is a tough story to tell, partly because it’s hard to find those keeper nuggets of truth that help the rest of us navigate our jobs. Sometimes, I think things just are and maybe really these experiences are like everyday life. You can’t predict them and the only way to prevent them is to stop living. Cara is a wonderful volunteer coordinator with a big heart as almost all volunteer coordinators are. She’s been doing this for years, has mentored and seen at least a thousand volunteers come and go. She has wisdom and has honed her instincts like a blacksmith with a prized sword. Several years ago, Cara met a young woman, Gwen, who showed an interest in volunteering. Gwen was hesitant, but hopeful and Cara encouraged her, letting Gwen take small steps to find her niche. Gwen rapidly blossomed into what Cara describes as “one of the most gifted volunteers I have ever encountered.” Gwen was magic with clients and had a presence that allowed even the most downtrodden individual a voice. Words such as “angel,” “like my own grandchild,” and “my confidante” came floating back on waves of gratitude. Cara quietly mentored Gwen, preferring to stand back and let Gwen’s innate ability flourish. As they spent more time together, Cara learned that Gwen had a difficult childhood. She was estranged from her mother and Cara, ever the professional, did not step in to fill those missing shoes. Instead, she listened and encouraged, much the same as she did with all of her volunteers. But this one, this one was like the Derby winning horse in the stable. Gwen was worth the extra effort because the clients deserved the best volunteer help. As the years went on, Cara heard more and more about Gwen’s chaotic life outside the organization. She had a family and a job and troubles seemed to swirl around her in a cacophony of drama. But Gwen still had that touch with clients, and although Cara’s radar now went up, she carefully kept watch on Gwen’s volunteering. Occasionally, Gwen would drop in and cry for twenty minutes. Illness, fights with her husband, disagreements with her boss, run-ins with parents of her children’s classmates would knock her world out of orbit. Concerned, Cara suggested counseling and one day Gwen came into the office sobbing about her counselor. Cara immediately removed Gwen from any and all volunteering. She told Gwen to please concentrate on herself for a change. What Cara did not say was that she now thought Gwen an inappropriate volunteer. I’ve always thought that volunteers have a shelf life. Whether illness, moving away, disinterest or inability to function in the best interests of the client are the reasons, it won’t matter. When it’s time for a volunteer to stop, either by our request or theirs, then it’s time. Can we compare volunteering to art? I think so. Some genius is tempered with madness. I don’t think it’s a stretch to apply that to our brightest volunteers. I’ve seen them. Brilliant volunteers who paint masterpieces like van Gogh but are burdened with issues that often become too much. It’s sad and we walk a fine line between encouragement and interference. We want not only what’s best for those we serve, but also what’s best for the volunteers. Sometimes, even we can’t make that happen. We can only do the best we can with what we have to work with. And who knows how well service fits within a volunteer’s view of the themselves and the world. We have to be able to let that door shut when volunteering no longer works for the clients and for the volunteers. If we can’t, then we’ll go mad. I have been volunteering with Hospice for three years now, and at a children’s grief center for one. I don’t think I could ever imagine not volunteering. I would hope for myself that volunteering doesn’t have a shelf life. I have experienced in my own life that no matter how low you feel, how horrible your life is, you are never able to not love someone. In fact, I would argue that the way out of dark holes is through loving other people, not yourself. When I meet with my hospice patients it is a breathe of fresh air. To be taken outside my world and invited into the world of another. To listen and be present to the struggles of others, strengthens my own abilities to cope. It was a couple weeks ago and I had a really long day at work, woke up early, and stressed out. I was riding my bike home when I saw a three legged dog in the road. I started knocking on doors until I found the owner. It was at this very moment that changed my day around. It is amazing what one good deed can do for the soul. Hi and thank you for not only commenting, but for your volunteer work with hospice as well. 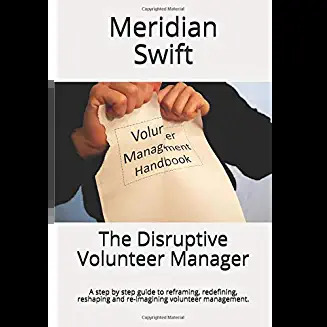 You have, in your description of your experiences, stated what, we, volunteer managers hope is the outcome for each and every volunteer. We want every volunteer to find the deep meaning and the soul-changing connections. That is volunteering at its best. For the volunteer, we hope that volunteering becomes a part of life. What I’m addressing in this post is the notion that we volunteer managers can hang onto volunteers forever. When we realize that we can’t, whether the volunteer leaves because of age, illness, circumstances, or because they go to another organization., then we can stop blaming ourselves because we can’t keep them forever. Believe it or not, we want what is best for our volunteers. Sometimes that means letting them go. Again, thank you for your incredible insight into volunteering. I am envious of your volunteer coordinator! Another great moral story Meridian. You touch on important interpersonal relationships here, the risks involved and a really important standard of professional practice. It’s easy to get drawn into Agony Aunt conversations, but knowing when and how to draw the line is a skill some people have to learn by experience. 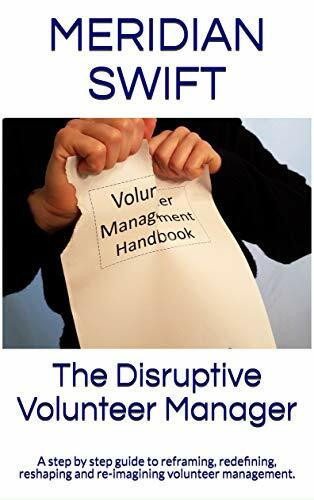 Do volunteers have a shelf life? Of course, but having to push people off the shelf is not easy. Is volunteering an art? Absolutely, and management of volunteers is no less a creative endeavour. So right, Sue! Our fine lines seem somehow finer than most which requires a very high and sharpened skill set to be successful in our jobs. I, too, have found myself overly involved in the emotional travails of a volunteer before even realizing it. I think that the natural empathy most volunteer managers have makes it difficult for us to know when and how to set boundaries. It’s hard, because as we get to know our volunteers, we do get invested in their lives and their well-being. This is a trait that makes us good at our jobs, but it can also be a real trap. After the last case of getting too close to a volunteer, and then realizing she was using our relationship to manipulate me, I’ve been much more careful. It’s a tightrope walk: empathy, kindness, and caring, yet setting the boundaries. It is, as Sue says, an art not a science. Thanks Kristen! I think we all have had these experiences with volunteers. I know I have had quite a few. What amazes me about volunteer managers is their ability to dust themselves off and continue to cultivate other volunteers. We don’t get disillusioned and think every volunteer is going to manipulate us. We don’t look at every volunteer and wonder when they will throw us under the bus. We look at each volunteer as a possibility, a work of art, and a joy to be with. That sets us apart in the management world. I know I am proud to be part of this group of incredibly talented individuals who quietly go about improving the world around them.